We are proud to offer Phoenix West Tack trunks. All trunks are available in either wood finishes (Cherry, Walnut or Ebony), Wood wrapped in Chrome or Brass, or Vinyl with chrome or brass. Vinyl trunks with chrome trim come standard with a stainless top, but vinyl is available as an upgrade. Brass trimmed trunks have a vinyl top. There are 19 standard vinyl colors but we can custom mix any color imaginable! Choose from 4 standard borders or create your own. 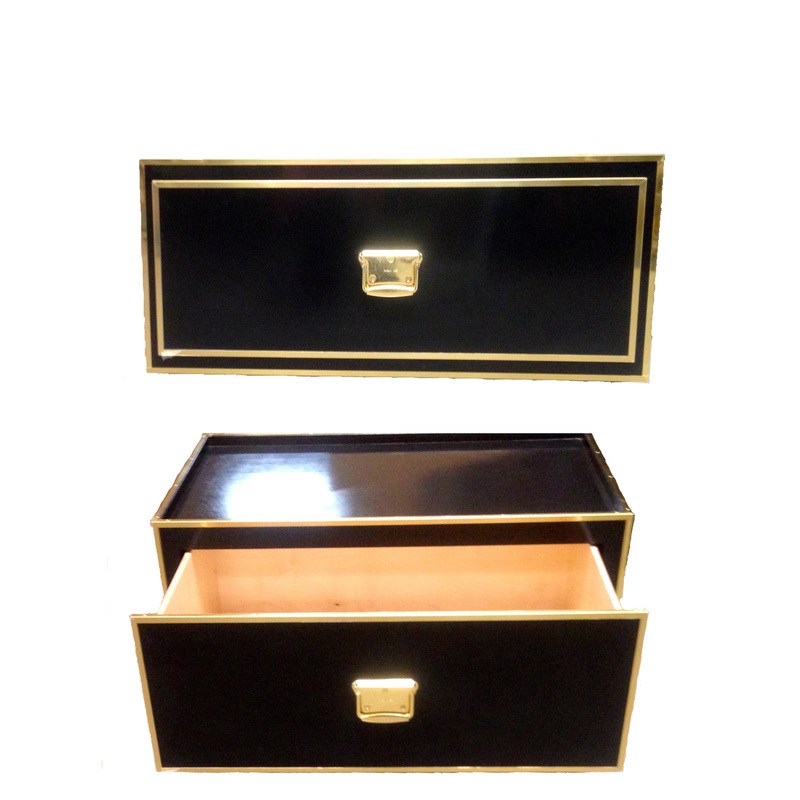 Monograms and logos can be reproduced on vinyl trunks either by building a pattern or a mold. All trunks are sealed inside with a clear finish, but stained interior is an available upgrade. Trunks are available in Large, Medium, Small and Utility size. Large and medium trunks include a tray and a grooming tote. The small trunk includes a tray. 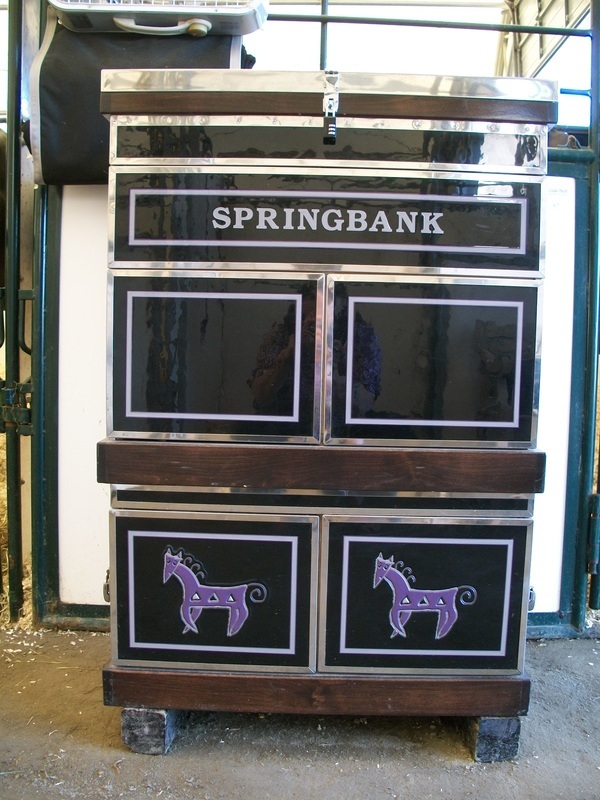 The Utility and small trunks can also be fitted with a bit box interior. A cork insert is a perfect upgrade! Our newest item is a blanket drawer stand for a large trunk. Place your large trunk on top of this special stand and enjoy the generous 12" deep drawer to store blankets, boots and any other overflow items from your regular trunk. The campaign chest is a two piece trunk that is perfect for medicines, business documents and just about anything else you might think of. Because it ships in two pieces it is easy to transport. The newest trunk is a bit valet - from the outside it looks like a standard upright. But open the front to reveal multiple pull out walls with hooks for bits. The ultimate in bit organization with the ease of movement of an upright. We offer the valet upright trunk with a variety of interiors. The wardrobe gives you shelves or drawers, a place for boots and your helmet as well as hanging space for coats and breeches. Space in the top for gloves and keys and mirror in the lid make getting ready easy. The beverage valet is a favorite piece of our staff and many of our clients. Designed with relaxation in mind, the lid opens to reveal a cutting board. The interior includes cork lined drawers for utensils, cork lined compartments for cocktail glasses and wine glasses (included). 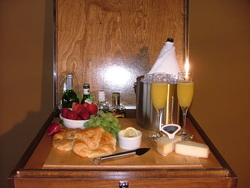 One drawer holds several bottles of wine and another includes an ice bucket and room for snacks. The finishing touch is a mini fridge in the bottom. Just roll this handy trunk off the trailer and plug it in! Instant party. We also offer the valet trunk with a medicine interior that consists of multiple drawers and a divided top for injectables. The valet with the saddle interior makes room for two saddles and brildes as well as a place for pads.